Recycling Styrofoam | Bad Human! Don't take chemicals from strangers! 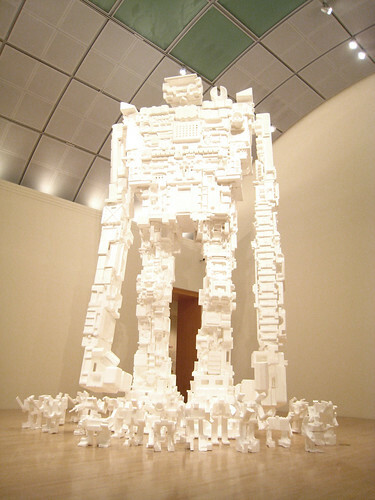 3 storey-tall robot made from styrofoam, originally uploaded by Amit Gupta. Sometimes I (N.) amaze myself with what I’m not aware. Since styrofoam has such a bad rap and is not recycled in most places, I assumed it wasn’t recycled at all. While I try to avoid it it does find its way in as packaging. Previously I simply chucked it out and doomed it to sit in a landfill for eternity. Little did I know that there is a small but growing trend to recycle this material which it turns out is highly recyclable. Today I was watching G Word on Planet Green and they discussed styrofoam recycling by focusing on Timbron International. They are a company that collects used styrofoam (it must be clean) and upcycles the material into various interior moldings. Apparently most companies don’t recycle styrofoam because of the cost to ship it to a facility that can process it. If you think about it while styrofoam is light it can be bulky to ship economically. Timbron gets around this by making deals with recycling companies that can compress the styrofoam before shipping it to them. In addition to working with recycling companies they also allow individuals to drop off or send in their styrofoam. While I certainly wouldn’t do this every time I get styrofoam I will keep it until I have a box full and send it off. The company suggests that individuals cut the styrofoam into a smaller pieces so that more of it can be fit into a box. Now you may be wondering what do they do to recycle styrofoam. Well the process is pretty simple, the basic material for styrofoam is pellets of polystyrene which are then pressed into molds. To recycle styrofoam it is broken back down into these pellets and then remolded. In the case of Timbron they are turning the material into moldings but they could just as easily turn them back into packaging materials. These moldings can even be found at your local Home Depot. In addition to being made from 90% polystyrene they are waterproof, mold and mildew resistant and emit no VOCs (volatile organic compounds). Apparently in the short time that Timbron has been operating they have already recycled enough polystyrene to fill the entire Empire State Building. However the truly scary fact is that less than 10% of the styrofoam that is produced is ever recycled. The rest is sitting in a landfill. Unfortunately none of the styrofoam recycling programs I found will take bubble wrap, packing peanuts or styrofoam meat trays. Many don’t accept cups or egg cartons either. You can of course take the peanuts and bubble wrap to a local mail store and simply avoid styrofoam cups and egg cartons. It’s a little bit harder to get around styrofoam meat trays but it can be done by purchase all meats directly from the meat counter or a local farmer or butcher. There is also a “Peanut Hotline” at (800) 828-2214. It’s a toll-free, automated 24-hour service that provides callers with the location of the nearest site that accepts loose fill packaging for reuse. I thought that was kind of cool. The bottom line is that we should all do everything we can to avoid products like styrofoam that can last forever in landfills but if it does sneak in with the mail or your new Energy Star Appliance at least you know that you can send it somewhere to be recycled. Wow! That robot is fantastic! I love the peanut hotline! I store the ones I get and reuse them, but for someone without the space to do so, it’s a great resource. This is exactly how I feel. I am 13 years old am think that my school should not use Styrofoam lunch trays. I feel so strongly about this topic that i am writing a persuasive essay for school and having a meeting with the principal at my school. Does anyone know how much it costs to recycle Styrofoam? The foam shown above are not Styrofoam. Styrofoam is a Dow Chemical trade name and is never made into cups. This is expanded polystyrene, not Styrofoam. Styrofoam is extruded polystyrene and made into sheets of foam that are light blue and used to insulate your homes. I am surprised Dow Chemical has not sued you back to the stone age for using their trade name..
Styrofoam like kleenex and chapstick has been utilized as an all purpose designator outside of its original trademark usage and I think Dow Chemical has much larger concerns or at least I would hope so.